Well, who still has their Halloween decorations up? ME!! Who's going to take them down? ERIC!! No, I'm just kidding. I plan on getting that done sooner than later. The key words...I PLAN. I've been going 90 to nothin' here lately and I don't really see an end in sight! At least next week, I'll be able to slow down a little bit on Thanksgiving Day. I'm still trying to decide if Eric and I will hit any of the Black Friday Sales. We did that last year and got everything we had on our list! Anyway, we are getting excited for Thanksgiving. We have A LOT to be thankful for! 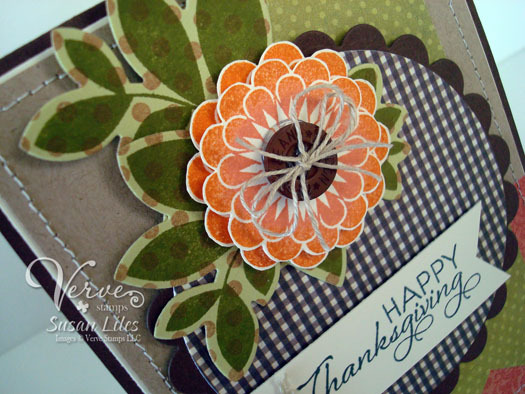 So I thought I'd put together a Thanksgiving card using some of my favorite products from Verve. I "sort of" followed THIS Mojo Monday Sketch, but ended up dropping a panel and replacing it with the sentiment flag and I also put the green piece behind the circle instead of in front. Can ya'll believe I used 4 stamp sets on this card? Oh and a Verve die also. 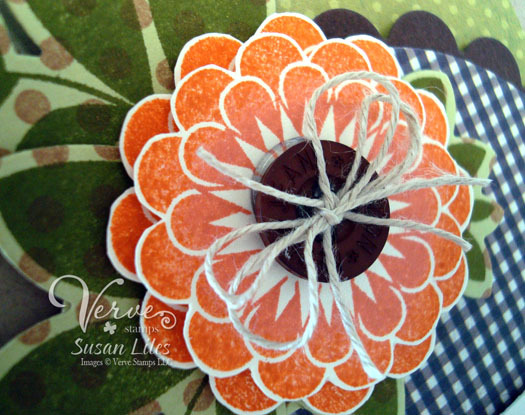 I pretty much think these are some of my all-time favorites--Happy Fall for the sentiment, Dream Big for the flowers (which I "rock and roll" stamped two different sizes of and cut out by hand--I see a new Verve die is needed! ), Bloom and Grow for the leaves along with a layer of polka-dots from Bountiful Backgrounds, and then they were cut using the Elegant Leaves Verve die. The lower left where the flowered paper is was looking kind of bare, so I stamped the polka-dots again on a little triangle and tucked it up under the green and circle panels as an afterthought. I like it lots! When I was done, I showed this card to Eric (I must have some "affirmation" issues as I always look for his approval with my projects! LOL!). He told me, 'that corner there on the bottom is curled up', and proceeded to smash it down. Um, honey, it's called a "detail" on my card and it's supposed to be like that. He said, "Oh". I thumped him on the head. Speaking of Black Friday Sales, Verve is having a sale EVERYDAY until November 30th on THESE stamps and dies! Don't make me thump you on the head, too. Go check it out! SUSIE Q-TIP: When sewing on your project, try straight stitching and then switching it to zig-zag midstream and then back to straight stitching. Be sure and change your settings with the needle IN the paper. Otherwise, it may not be straight when you start back with the straight (stitch). Some of my favorite Verve sets! Looove the flower and leaf. Fabulous card all round.